There are three distinct strata to the populations of the Emirates and Oman--the Arab nationals whose land it is, the Western advisers and workers of expertise earning double or triple of what they'd be earning in their homelands, and the third-world workforce, earning considerably more than they would in their homelands, but still not a great deal. All three respond to me with equal levels of generosity and curiosity. The nationals welcome me with a hospitable fervor. The Westerners seem eager to bond with one of their background who has also been drawn to this rapidly transforming land. And the workers seem to appreciate someone laboring on a bike under the fierce sun, as they labor away with their shovels or in some other menial chore. All exude a genuine friendliness. Never before has the bicycle been such a magnet of goodwill. As I was sitting in a Starbucks taking advantage of its WIFI, a young man asked me if I was Dutch, his nationality. He had noticed my Ortlieb panniers, which he mistakenly thought were Dutch as he had once seen them on a Dutch touring cyclist. He was working here as an engineer and was traveling with his parents, showing them the country. A South African, the third I've met in these travels, stopped on the highway outside of Abu Dhabi to tell me there was an alternate route to the ten-lane wide super-highway we were on a few miles ahead. It would add quite a few miles to my route to Dubai to swing out into the desert to pick up the road, but I was in no rush and didn't object. The instant I left the highway I was in the barren desert and had the road virtually to myself. It was another first-rate, four-lane highway with wide shoulder. But there were no towns nor service stations. I was hoping there might be one when I came to the road I needed to turn on to heading east towards Dubai, but there wasn't. Nor were there any the next fifty miles. Since I was abiding by the local dictum to always carry twice as much food and water as you think you might need, that was not a concern. The traffic though was a different story. The distant road that looked so inviting on the map turned out to be a two-lane highway that was a trucker's alternative to the main highway I had been on. The trucks were barging down the road bumper-to-bumper in both directions as if they were in a rush to safe the world. There were wide shoulders, but the truckers took over the shoulders for extra space between their columns so they wouldn't have to pass so closely, bucking the opposing tunnels of wind they were both creating. The ones alongside me created a draft, but it did not compensate for how closely they passed, sucking me into their current. It was by far much, much more treacherous than any of the riding I had been subjected to here. The South African had no idea what he had sentenced me to. This road was actually referred to as a "Trucker's Road," so I couldn't take a break and await that spell when truckers are banned from the roads. I simply had to hang on and hope for the best. Luckily it lasted less than twenty miles until I turned off onto the most distant of the Ring Roads that bypass Dubai, highway 611. It was a ridiculous twelve lanes wide and had hardly any traffic. Signs consigning trucks to the three right lanes were hardly necessary. It was like many of the super highways I had ridden in China a few years ago, constructed not for the present, but in anticipation of needs in the years to come. This road was way out in the boondocks. There was nothing but desert to my right and not much to my left. There didn't seem much need for this road, let alone a road so wide. But with more money than the government knows what to do with, a lot of it is funneled into building more and better roads. The city was a good ten miles or more distant. 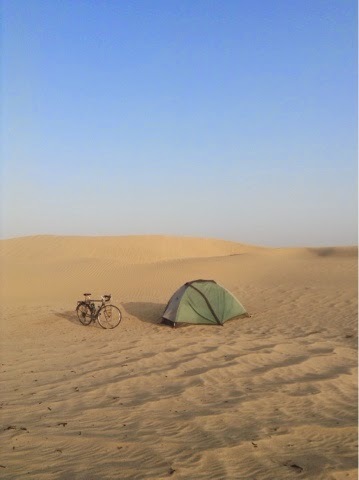 This was the wilderness, enabling me the ease of another superlative desert campsite in the wave of dunes just beyond the road. The only service station along the sixty mile stretch of 611 I rode before turning off to the tiny Emirates of Ajman and Umm Al-Quwain, beyond the larger Emirates of Dubai and Sharjah, included a McDonald's. It was the Golden Arches in the desert ahead that brought it to my attention. The service station was well-stocked with drinks and foods, so I didn't have to resort to a Big Mac, higher-priced than back home. Even though I nibble on dates all day long, that doesn't deter me from date-milk. Its not as common as chocolate and strawberry and banana milk, but its always my preference. Not only is it tasty, but it provides the most calories. I drank a pint, and then had another, as I are a couple of peanut butter and banana sandwiches. 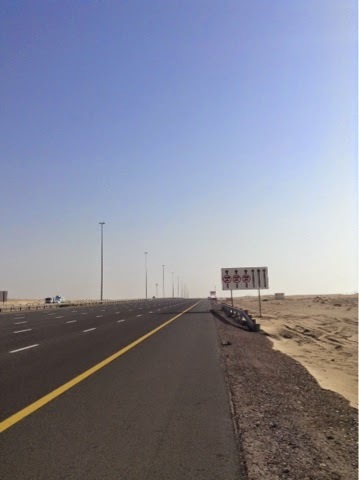 After I left 611, which diminished to six-lanes after Dubai, a few miles down the four-lane wide highway to Umm Al-Quwain, a car pulled over and a smiling white-robed guy waved me down. He introduced himself as Muhammad and said he was an Algerian who grew up in France and had bicycled around France. He'd been living here for two years with his wife and four children working for the Alliance Francaise and invited me to his nearby home for a cup of coffee. 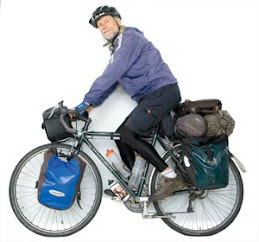 He wanted his children to meet a touring cyclist. They lived in a recently-built six-story apartment building. 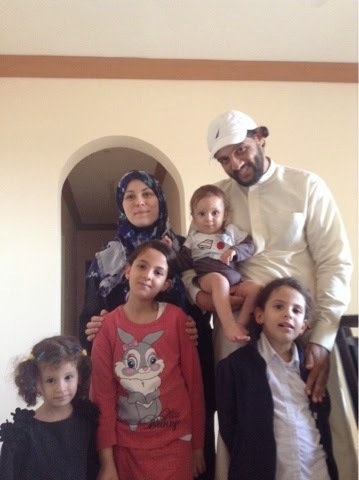 His young children were all tri-lingual--French, Arabic and English. His French wife spoke perfect, accent-less English that she had learned from watching American cartoons she explained. She brought out cookies and chocolate. They were out of cheese, but generally had a supply, as the French Carrefour supermarket carried brands from home. Her husband liked camel's milk, but she had not been able to develop a taste for it. He wasn't an ardent enough of a cyclist to have his bicycle here, but he had followed The Tour de France one year in a camper. He had a Coleman tent in the back of his car that his family used on occasion for outings into the desert. They were a very lively and delightful family. Muhammad said it was well worth the detour to Umm Al-Quwain, as it wasn't so developed and gave a good perspective on what the region had been like before the excessive transformation that dominates Abu Dhabi and Dubai. For the first time I saw run-down buildings and vacant lots. There was no spreads of glass or beds of flowers or non-indigenous vegetation being forced into the environment. There were no outrageous architectural novelties. No glitzy glass high-rises. The only eye-catching buildings were a few recently constructed semi-grandiose mosques to go along with the many smaller ones every few blocks.. A long beach front had one lone cafe that offered drinks and snacks, but was mostly a water-pipe bar for smoking flavored tobacco. 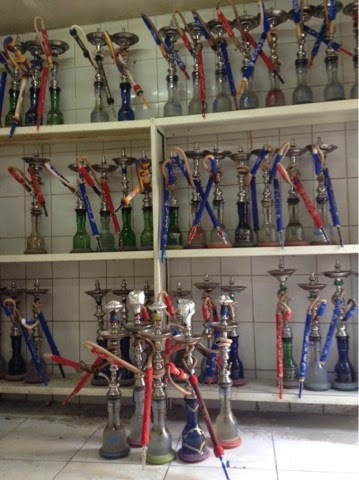 I had stumbled upon one of these in Oman. It was filled with men and their lap tops. This one too offered WIFI, just what I was looking for. I could look out on the breaking waves to one side and across the street where a group of rag-tag Indian workers were playing cricket in a weed-filled lot. This was a more traditional side of the region, though still fully flavored by the times.